I do not know if you have ever heard of the 52 week money challenge. 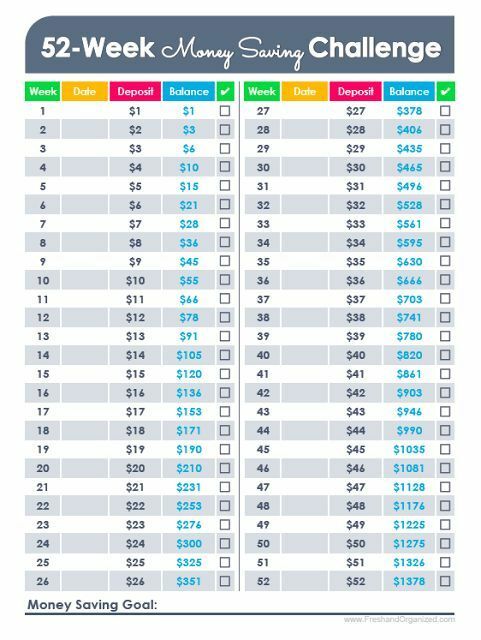 But I came across this on Facebook one day and decided I woud do this to save money for a little vacation for the family. I started on January 5,2017. As of today April 9, 2017 it has been 13 weeks. I have saved $91 dollars per the challenge. I know that it does not sound life very much money now, but when I am finished with the challenge I will have $1378.00 saved up. Here is how I started. I went to Google and typed in 52 Week Money Challenge and a got a graph of how much money you need to save per week. I then copied it and pasted it on a large manila envelope. From the graph I follow the weekly money amount to put in my envelope. It has been an EASY way to Save Money, because the amount I put in weekly I usually have in my wallet. I have put the picture of the graph here so you can follow along with the Challenge. Remember to have fun with this and do it every week . You are saving for whatever you want. Easy Peasy.